The DORN-METHOD - Spine-Healing on it's best level - Everyone should know about & use it! What makes the DORN-METHOD so special? Effective, easy to use, easy to learn. Success since more than 40 years! 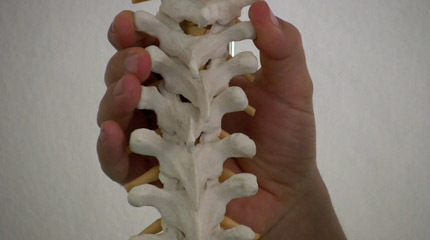 The DORN-METHOD is an easy way to resolve misalignments of the spine, the vertebrae itself, the pelvis and the joints. Related to the joint treatment is the correction of different leg length possible. The DORN-METHOD was received around 40 years ago from Dieter Dorn, a layman-healer in Germany. Since then thousands of people have been treated very successfully and with mostly instant results. Meanwhile thousands of people have learned the DORN-Method for professional reason or to help their families, friends or neighbourhood. The DORN-METHOD uses different practical applications than the "Main Stream-Medicine". In it's theoretical approach, it uses simple static principles, which have to be present in a healthy body and uses the movement of parts of the body, which the treated person is doing for him/herself during the therapy. This is a key-difference to normal therapy. The person who is treated, is involved with his/her own action and movement as part of the healing process. This site will show some principles about the DORN-METHOD and will help to spread this easy to use and very effective therapy around the world. The DORN-METHOD should get it's acknowledgement as a favorite way of Spine-Healing Treatments in the world. It is a method which has very low costs involved (often the problems are within one or two treatments resolved) but is really helping and treat the cause of the illnesses of the people. This wonderful therapy should be in the hands of all Healers, Physical Therapists, Physiotherapist, Masseurs, Massagers or Medical Doctors. In Germany it is already a standard, to treat people with the DORN-METHOD for Back Pain and many Spinal and Pelvical Disorders. To help that this method get it's place as a standard treatment in the world is my goal and the reason creating this site. I work since more than 19 years with the DORN - METHOD. I'm a from Dieter Dorn certfied Teacher and Practitioner. I have treated and taught successfuly thousands of people with this method. I'm very excited about the DORN-METHOD and I hope that from my "fire" for it, some sparks will jump to you and set a "Fire of excitement" which is moving around the world for this wonderful, miraculous healing method! I hope to reach and to meet many people worldwide to spread the knowledge and to help to reduce and relief, pain and suffering in the world. In Germany about 37 years ago, was a Spine Healing method developed and presented by a layman-healer. Dieter Dorn used this therapy for his family at first. It then grows to the situation, through the visible success and word of mouth, that every evening around 15-20 people asked for a treatment. Dieter Dorn usually has done it for free under taking donations. His work was so successful that therapists of all kind and people who have been suffering for years, put their attention on this very easy, but wonderful effective method. This site will honour his work and contribute to the worldwide use. My name is Amanté Samraj Riethausen. I work as Healer and Teacher since more than 23 years. The last 17 years I have been focussed on teaching the DORN-Method mostly to Professionals like Physical Therapists, Physiotherapists, Masseurs, Massagers or Health Practitioners in Germany, Austria and Switzerland. My enthusiasm for this DORN - Method is very big. Receiving so many gifts all the years in working with it, created the wish to share this with more people worldwide. During our lifetime, earlier or later, the symmetry of the body is disturbed. That means on a skeletal level, that the lengths of the legs are different, the pelvis is out of alignment and the vertebras and even so whole spine itself are no more settled correctly. This does not only disturb the energy flow, but even creates different illnesses within the body. Even organs and functions of the body degenerate or fail. The DORN - Method is able in Co-Work with the patient to replace vertebras and spine, corrects the leg length and puts the pelvis parts in right order. This mostly takes not weeks of work. The change is often possible with one or two treatments. To make this work it is necessary to work with some pressure and a movement of the patients legs, arms and head. The method works in a "remembering-effect" of the body to correct itself and let the body does this for itself! What makes the DORN - Method so special? After an intensive diagnosis of the leg lengths, the pelvis and the alignment of the vertebras and the spine, works the DORN - Method with the whole body of the patient. With given exercises, which have to be repeated for a longer timeframe at home, and without any manipulative work the leg length will be fixed with a little exercise. Pelvis and vertebras will be corrected with pressure on special diagnosis points, like the Spina ilica posterior superior or the Os Sacrum itself and the Processus spinosus on the vertebras. This correction of the skeletal body structure is accompanied by a swinging of legs, arms or turning with the head, meanwhile the therapist is pushing with the thumb, hands or fingers against the named parts of the body structure. It is mostly unbelievable how easy and light the body reacts and set itself into alignment very quick. In fact it takes two days to learn the DORN-METHOD! Sure some training is necessary to become really good and perfect. But even with no experience people have mostly instant results. I offer classes for the DORN-Method worldwide for all Professionals like Physical Therapists, Massage-People, Health Practitioners, Natural doctors, interested orthopedists or even to interested laymen. If you are an organizer or foreman of a club, a society, a clinic or an organization and you are interested and excited to help growing this work, then please contact me preferable by e-mail. Then we can discuss what is possible. Covering travel costs and my fee I travel with my wife all over the world to spread the knowledge about this wonderful and very helpful Healing Technique. Feel free to offer any suggestions about creating seminars, healing classes or individual consultations you may have. I wish to share my wonderful experiences of the last more than 16 years with so many people as possible. I love from my heart to do this work. There is rarely something where you get so fast results and where you really can feel the change in your fingers during the „work“ and get instantly positive feedback. I feel very blessed to do this work! Thanks to Dieter Dorn and his amazing courage and power. When you like to use the DORN-METHOD for your profession, doctors or clinics like to use it and you like to be trained and to profit from our experience and knowledge then contact us at info@spinehealing.info ! We offer Trainings in Lindau/Germany to become a DORN-Spinal Therapy TEACHER in your country. We offer too a Video DVD Study Course. Ask for our terms, dates & conditions for this. 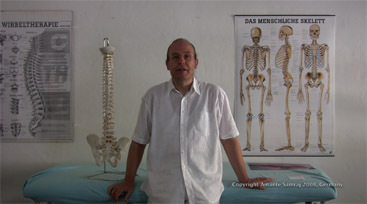 In Germany about 40 years ago was a Spine Healing method developed and presented by a layman-healer. Dieter Dorn used this therapy for his family at first. It then grows to the situation, through the visible success and word of mouth, that every evening around 15-20 people asked for a treatment. Dieter Dorn usually did it for free, but taking donations. His work was so successful that therapists of all kind and people who have been suffering for longtime, put their attention on this very easy, but wonderful effective method. This site will honour his work and contribute to the worldwide use. The spine with the nerve-centre (Medulla spinalis) in it, is an important part to distribute the flowing energy into the whole body. All organs and physical functions are controlled from within the spine. Each vertebra is connected to a certain organ or important for the right function of the body. A spine which is really functioning and healthy is base of health and becoming/staying healthy. 98% of the people have over the years one or more vertebrae which are no more in alignment and which are no more on the right position within the spine. At these places the energy gets lost and can not be delivered in the necessary amount to the places in the body where it is needed. Energy blockages are created. These energy blockages can lead to back pain. "Pain is the call for flowing energy in the body". When the energy is blocked then even many illnesses like headache, insomnia, allergies, rushes, pain in the neck, dizziness, difficulty in breathing, gall bladder problems, disturbances in the circulation, tiredness, constipation, varicose veins, hemorrhoids and much more can develop. If vertebrae or discs (Disci vertebralis) are out of order, irritations or inflammations on the nerves, which are coming out of the spine, can happen.These irritations are able to disturb the function of the body for instance in the organs itself or in the limbs. This can lead to various diseases or organs or limbs will be so effected that their function will become very weak or gets lost. A spinal nerve (nervi spinalis) getting the weight of the pressure of a cube of sugar, can lose up to 50% of it‘s efficiency. Through a vertebra out of alignment or a disc, a nerve can easily be touched and being irritated. If a nerve will totally be pressured, limbs or organs would immediately stop working. This from the German, Dieter DORN, located in the Allgäu in Germany, about 36 years ago, intuitive received method, is based to diagnose, under the help of the thumbs, the vertebrae which are no more in alignment. Normally all Processus spinosus are in an exact vertical alignment. The vertebrae which are out of alignment, will be corrected in a smooth and effective way under specific movement of the patient itself. With the light pressure of the thumb, the vertebrae slides under movement of legs, arms or head, back to it‘s ideal settlement. This works too with the more difficult areas as the sacrum, the pelvis, hips or the Atlas vertebra. It is no chiropractic. The therapist is creating a „new“ vertically spinal column, which is the base for the right flow of energy in the body. Even tendencies of scolioses can be treated successfully. After correcting the spine, to have real success, it is necessary that some factors are implemented. One is the need of even leg length and a second one is to stop being in a habit to do something in an unhealthy way, like for instance carrying something always on one side or overcrossing the legs while sitting. If the founding of the spine, the pelvis and the hips are out of order, the spine can only correct this through side movements of the vertebrae. After birth, about 98% of the people have even leg length. But when you do a diagnosis later with people from 5 years old on and with adults, you will find that 95% have no even leg length. The cause for this is a subluxation of the hip joint. This happens as a cause of over stretching ligaments and muscles in this area. This will be caused by careless sitting, driving in the car, bad habits while sitting or doing unappropriate sports. Every treatment starts with a test for even leg length. If the test fails, people get exercises at the hand, to do it for themselves at home for a period of approximately 3 months at first. After the correction of different leg length, shoes which are made specifically to adjust this difference, are often not any more necessary. It has come out very clearly over the years of practical experience with the DORN-METHOD, that the alignment of the pelvis parts like Os sacrum and Ala ossis ilii is of central meaning, that the spine can itself align correctly in the vertical direction. In many cases it is like magic, what a spine can do after the right treatment of the pelvis parts to align it's parts correctly. Without doing anything on the spine itself or the vertebrae, the spine adjusted itself in the correct direction of the vertical, natural expression. The DORN-METHOD is the only method I know which serves in this direction without manipulate the body, only forcing him to remember where it's ideal alignment is situated. We can't push the body to do something what it is not able to do. We offer special treatment and the body does the work for itself! 98% of the people have over the years one or more vertebrae which are no more in alignment and which are no more on the right position within the spinal column. At these spots the energy gets lost and can not be delivered in the necessary amount to the places in the body, where it is needed. Energy blockages are created. These energy blockages can lead to back pain. "Pain is the call for flowing energy in the body". When the energy is blocked, then even many illnesses like headache, insomnia, allergies, rushes, pain in the neck, dizziness, difficulty in breathing, gall bladder problems, disturbances in the circulation, tiredness, constipation, varicose veins, hemorrhoids and much more can develop. Do we have to repeat the treatment with the DORN-METHOD to be successful? Mostly after one treatment most of the problems and pains are gone or improved. Results are to get mostly very quickly. After treatment people feel "taller", more free and it seems to be lighter. Sometimes it is necessary to be out of the pain, to let follow some treatments, this in the case of severe disorder. Normally 1 to 3 treatments do a lot and regain the original condition of the body. It would be ideal to have 2 to 4 treatments with the DORN-METHOD a year to take care of the right condition of the spine! It would prevent many deseases and would help to be free of pain. What is important to know after a treatment with the DORN-METHOD? Naturally the muscles have to react to the new alignment of the vertebras. This can take a few days and has often as attendant symptoms stiffness or sore muscles which can be felt for a few days, mostly only 2 to 3 days. The next 2 to 3 days after treatment, no big efforts should be made and the body should be treated with care. Through the new use of muscles and muscles groups some feeling of soreness can be felt. Sports, Gymnastic, Stretching and so on should be avoided, to give the body a good chance to integrate the new alignments. Like in Homoeopathy sometimes symptoms can become worse at first. That is a good sign that the body is correcting itself accordingly. In addition through the new flow of energy in the back, toxic deposits will be released and are moving into the bodies circulatory system. To dilute them and to make it easy for the body to take them out it is necessary to drink 2 to 3 liters of fresh water. This directly after the treatment (same day) and for the next 2 to 3 days would be a good support for the body. What can happen in addition after a back treatment with the DORN-METHOD? Often on the places where the vertebras have been in misalignment for longtime, emotional, psychological or mental blockages have been manifested. In release the misalignments the blockages are resolved and psychical or emotional release can be felt. With this the energy flow increases and the healing of the treated person can move forward. So it is not uncommon that people after the treatment ave been aware of old inner pictures, emtions and feelings, even smells or bad tastes can be observed to come up. Is it possible to harm someone with a treatment with the DORN-METHOD? During the last 37 years of treatment with the DORN-METHOD nobody has been harmed. The method is working very soft and no damage of muscles or tendons or intervertebral discs is possible. It was discovered that such a massage could be very well combined with the Dorn Method. Many spine problems, like pain due to “slipped” intervertebral discs, lumbago, etc.... could be easily treated without any danger of further damage and with successful results. The Breuss Massage is a sensitive, energetic manual massage of the back, which helps to resolve psychical, energetic or physical blockages. It can stimulate the regeneration process of undernourished intervertebral discs. In case of osteoporosis or severe pain, the massage should be done very gently. It must not cause any pain. In cases of severe spinal problems and pains or hard muscles Breuss Massage is an ideal preparation for the Dorn Method that might follow. A Breuss Massage can be offered after the Dorn Therapy to stretch the spine a little more. This massage can be repeated as often as desirable. Use the DORN-METHOD for self-help or to help others. Participants in the seminar take it in turns to practice the DORN-METHOD, and then experience the benefits first hand. The teacher will show you the best way to do the techniques, and make sure that everything that you ever do by yourself, or with another person, will be absolutely risk-free. The seminar takes two days to learn. In these two days you will learn basic and advanced techniques back-to-back. Each seminar is part theory and part practice. are simple without sacrificing information that is vital for anyone working with the body in a hands-on therapeutic environment. The only requirement is an interest and willingness to learn something new and unusual that will improve a person’s health outlook for life. After the seminar, all those taking part will be able to use this method with confidence. As you would expect, the method has to be practiced after the seminar to expand and deepen the skills that are acquired. Presentation of a complete treatment using the DORN-METHOD. This will be followed by hands-on participation for all attendees. Approach to exercise and self-treatment. In addition to the DORN-METHOD, it is possible to integrate the BREUSS-MASSAGE, which is an excellent massage technique. The BREUSS- MASSAGE has the ability to totally relax the body and the whole person while strengthening the discs. It works mainly in the muscles attached to the SPINOUS PROCESS using massage. Added is a sequence of laying on of hands, which supports the relaxing and aiding factor of this therapy. The BREUSS-MASSAGE has it's roots in Austria. If people are interested to learn this wonderful wellness-massage additional 4.5 hours would be necessary to learn this fine massage technique. Probably best on a third day. Everything in the course is explained in complete detail. It is all shown in gradual steps so that you don’t miss any important details, and can easily copy each demonstration. The author, Amanté Samraj, has had more than 13 years experience in educating, training and coaching thousands of people who work in the Health care Business. He has also shown many thousands of people who come as lay people to the seminars, and go home able to use this method just as successfully as many health professionals. Amanté Samraj is offering classes for the "DORN Spinal Therapy" worldwide for all Medical Professionals like Physical Therapists, Physiotherapists, Masseurs, Massagers, Health Professionals, Natural Therapists, Orthopedists -- and even interested lay people. More courses especially in Lindau are planned. Please look again here from time to time. LINDAU is in the South of Germany. It is a little Island in Lake Constance. A wonderful place to be and to travel. You can visit in booking a course in LINDAU, the biggest lake of Germany with a wonderful surrounding of mountains. There is no industry and a very good air to breath. Lindau is very close to Austria, Switzerland and Liechtenstein. I offer classes for the DORN-METHOD worldwide for all Medical Professionals like Physical Therapists, Physiotherapists, Massagers, Masseurs, Health Practitioners, Natural doctors, interested Orthopedists or even to interested laymen. If you are an organizer or foreman of a club, a society or an organization and you are interested and excited to help growing this work, then please contact me preferable by e-mail. Then we can discuss what is possible. Covering travel costs and my fee. I travel with my wife all over the world to spread the knowledge about this wonderful and very helpful Healing Technique. My name is Amanté Samraj Riethausen. I work as Healer and Teacher since more than 25 years. The last 19 years I have been focussed on teaching the DORN-METHOD and BREUSS-MASSAGE mostly to Professionals like Physical Therapists, Physiotherapists, Masseurs, Massagers or Health Practitioners in Germany, Austria and Switzerland. My enthusiasm for this DORN - Method is very big. Receiving so many gifts all the years in working with it, created the wish to share this wonderful therapy with more and more people. I have been certificated to teach the DORN - Method 19 years ago by Dieter Dorn himself. I have trained thousands of people since then and my thankfulness goes to Dieter Dorn while using his method, has changed my life completely and has brought so much joy and possibility to help in my life! I for myself can't imagine a life without the "DORN-Method"! A great focus of my work is going to do and teach energy work with the hands without touching the people and a deep spiritual work, both personal and in seminars. My joy is to travel and to teach, so I‘m open for every opportunity to do this worldwide. You could be a health professional, suffer back pain yourself, or just be someone who wants to know more about how to overcome back and joint problems. You get all the information you need about what to do, and how to do it the easy way -- step by step. You get more than just a video. This is a complete course. You will also receive a full set of written instructions and images in a PDF format that will show you exactly what you need to do, and give you detailed advice on how to do it. Invest in your health. Be Free of Back Pain. If you are a health professional, it is something that you can teach your clients. You will clearly see how to help yourself and others to straighten the spine with the "DORN Spinal Therapy" method -- without any risk. If you still need a professional to take care of your back after using the "DORN Spinal Therapy" method, you can tell them what to look for, and explain a method that is so simple, yet works just about every time. You can learn how easy it is to be free of back and joint pain right NOW. If you are a health care professional, you will now be able to alleviate the cause of back pain with complete CONFIDENCE AND SUCCESS. This therapy has been extremely successful in Germany since it was introduced more than 37 years ago. As consumers, Germans are used to a high level of efficiency in everything. If something doesn’t work Germans are just not interested. And now "DORN Spinal Therapy" is spreading from Germany throughout the world. You have been very lucky to stumble on an opportunity to find out about this therapy now. Be the first to help your clients with this therapy and you may never have to worry about new clients again. "The DORN Spinal Therapy", works so well that everyone that uses it usually spreads the word. And that’s money in your pocket. Word of mouth advertising is the best advertising -- as we all know. You may never have to advertise again if you are the first in your neck of the woods to use DORN Spinal Therapy. Unlimited e-mail support from the author, Amanté Samraj Riethausen. You can take care of yourself, your children and your loved ones, that they are in a very good condition related to the spine, the joints and their health. I could go on and on, but now it is your turn to find out what the "DORN Spinal Therapy" Video Home Learning Course is all about. You get all explained very exact and precise. All is showed and explained in steps, so that you can follow exactly what will be demonstrated. The author Amanté Samraj has more than 13 years experience in educate, train and coach thousands of people who work in the Health Care Business and with many thousand people who are coming as layman to the seminars and go home and are able to use this method succesfully for themself! Amanté Samraj is offering classes for the "DORN Spinal Therapy" worldwide for all Medical Professionals like Physical Therapists, Physiotherapists, Masseurs, Massagers, Health Practitioners, Natural doctors, interested Orthopedists or even to interested layman. See below some screenshots out of the Video to get an impression on what exact level you can study the "DORN-Spinal Therapy" out of the comfort of your home! Disclaimer: The information provided in this video is for educational and informational purposes only and IS NOT intended as a substitute for professional medical advice, diagnosis or treatment. Please visit your professional healthcare provider for any treatment or professional advice regarding your medical condition and health. This is the best and only online Course available worldwide for THE DORN Spinal Therapy! and start learning this wonderful therapy immediately. No download - only streaming. The complete Course, Part I to III is splitted in around 50 little lessons so you can watch and learn step by step how your spare time is allowing it! -one of the worlds best methods to work with the spine and help the people! Buy this outstanding course for a fraction of it's worth! Use the following Link to buy with PayPal. The price is including handling and shipping! After your payment you get a confirmation e-mail. We ship worldwide with normal letter. MUCH MUCH BETTER SOLUTION FOR LEARNING. You have with the order at once access! Owner of the information given on this site is the praxis "Naturheilpraxis" of Amanté Samraj Riethausen, Postfach 1766, 88107 Lindau, Germany. Tax-number: To beware privacy the tax numbers are only given to people or identities who have a proven interest. Responsibility: All content of this site was reviewed carefully. We overtake no guarantee for the truth, completeness and actuality of the written words and content. For the content of the websites of given links is only the owner of these linked sites responsible. We have looked at the sites for being in the range of normal laws and have not found any complaint. Copyright: All written informations, texts, Logos, pictures and the design are protected by law by Amanté Samraj and "Heil-Insel Lindau". To use parts of this site is only allowed after permission from "Heil-Insel Lindau" and purpose and way of using it is manifested in written words.